Aircraft shortly after departure struck several birds, returned and landed without incident. Aircraft during pushback from the gate, struck the jetway bridge. Aircraft’s leading edge struck a stationary fuel hydrant cart. When cruising at about 11,000 feet, one or more birds struck the aircraft and penetrated the windscreen. While enroute after dropping a patient, rotorcraft crashed. The pilot was trying to make an emergency landing in Dutchess County after reporting an oil pressure problem when the plane crashed. Aircraft reported engine failure and crashed. The medical helicopter during a training flight crashed while trying to land. While hovering, rotorcraft skid struck the pavement. Rotorcraft struck power lines and crashed. Aircraft crashed into a field. Aircraft disappeared from radar in an area of thunderstorms. Aircraft impacted terrain and was destroyed. The aircraft landed short of the runway. Investigators later found only half a gallon of fuel in the tanks, which may suggest the fuel gauges were faulty. Ultralight aircraft crashed under unknown circumstances. 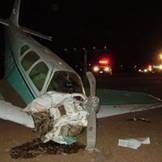 Pilot experienced a loss of power and was forced into an emergency landing. Witnesses reported that the engine died shortly after take off and the pilot had to restart it at least once. The plane crashed behind a home. Aircraft crashed shortly after departure. Aircraft crashed while approaching the end of the runway. Aircraft on landing, crashed on the runway. 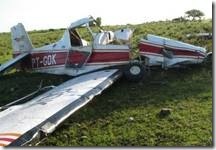 Aircraft lost engine power and clipped a tree and spun around before crashing. On approach to the airport the pilot declared an emergency stating that his engine was on fire. All communication was lost after the report that he had the field in sight and tried to land. While being marshaled into gate, left wing tip struck the jetway bridge. Aircraft crashed after taking off from a touch and go. Plane developed fuel related engine problems and came down in a forest, a few moments after takeoff. Homebuilt plane crashed in the water under unknown circumstances. Helicopter made an emergency landing on a sandbank in the middle of the river, possibly after striking a power line. Aircraft received an engine fire indication and the engine was shut down. Mechanics determined a malfunction of the engine’s fire loop and were able to repair the fault. Aircraft crashed when the pilot was preparing to carry out crop-dusting. Aircraft veered off the runway onto the grass in wet and windy conditions at the Port Elizabeth Airport during the take-off roll. Aircraft overran runway after landing, nosewheel collapsed on soft ground. Airplane collided with power line tower and crashed. Aircraft crashed in heavy fog. A military helicopter crashed under unknown circumstances. 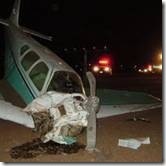 Aircraft crashed during training flight. Two US Army helicopter pilots were killed when the helicopter made a hard landing. Helicopter crashed into the sea for unknown reasons. © 2009 Aviation Safety Journal. All rights reserved.